This year the Northeastern Regional Conference will focus on "Rethinking the Purposes of Education and Lifelong Learning in the 21st Century. "The goals of education continue to be re-imagined and contested by local, national and global actors, who believe in, or take issue with, the power of education to affect the well-being of people and the planet. How statements of the purposes of education influence policy priorities, system reforms and school realities is an issue that deserves further exploration and analysis. With these complex and oftentimes contradictory forces at play, the conference organizers invite participants to address different analytical and policy-oriented questions about the aims and purposes of education. 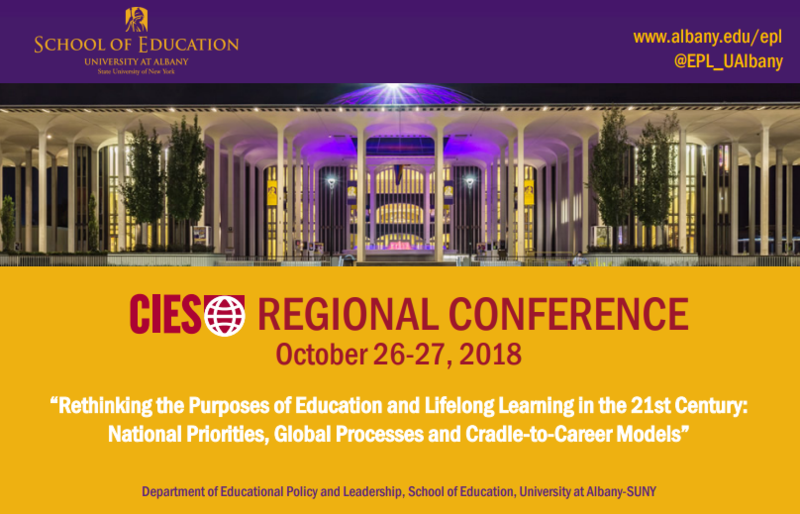 All proposals must be submitted via the conference website, www.albany.edu/cies2018/ beginning on June 25, 2018. The early-bird deadline for submitting proposals is July 23, 2018. The deadline for submitting all conference proposals is September 3, 2018. For more details, please visit the conference call for proposals here.